Blurb: The young nation of Fatrasta is a turbulent place – a frontier destination for criminals, fortune-hunters, brave settlers, and sorcerers seeking relics of the past. Only the iron will of the lady chancellor and her secret police holds the capital city of Landfall together against the unrest of a suppressed population and the machinations of powerful empires. Oh, friends, this freakin’ book. I can’t decide if I like it better than the previous trilogy or not, but I definitely f-ing loved it, so have no doubts about that. Sins of Empire takes place roughly a decade after the events of The Powder Mage trilogy. At first, it was a little weird, because we had a few characters from the previous books that are central characters in this story and even though I was used to the world and the magic system now, “four” books in, we’re in a completely different part of the world and our returning cast, Vlora and Olem, are in completely different roles than I ever expected them to be playing. And even though I love Olem, Vlora wasn’t my favorite character in the previous trilogy. There were a few other characters that I particularly loved, though, and, for the first half the book, was really wishing I could find out what happened to them. Oh boy, was I in for the best surprise. Even before that surprise, though, I was most enamored with this book in not only how clever the plot was, i.e., it read, in some ways, like a thriller, because of how many twists and turns there are and how intricately all of the plotlines are woven together; but also because I found myself most definitely growing attached to our new characters. To Styke and his good heart and mad mentality, to Michel (particularly the way he was written; that was brilliant) and his desire to do the best he could, no matter what circumstances he was up again. While she was just an “eh” character for me in the first trilogy, kinda apathetic because I was invested in other characters way more, having her in the spotlight here and seeing how much she’s grown and the woman she’s become has truly turned me completely onto her side. I can’t help but admire her strength and her general ability to be a complete and total badass. Of course, that ending, too, though. I can’t talk about it too much (because, you know, spoilers), but I will say that I’m ridiculously curious about the latest addition to the worldbuilding, how exactly it works and what on earth Vlora and company are going to do about it. Though the battle and the war felt really small scale and rather quick, in comparison to lasting the entire first trilogy, I don’t think we’ve avoided all the punches just yet (and this war is far from over). Luckily for me (and what finally prompted me to read this series after wanting to for so long), I have a copy of the latest and the second book in this trilogy, Wraith of Empire, thanks to Orbit sitting on my bookshelf right now. Time to continue the McClellan binge. What a glowing review! 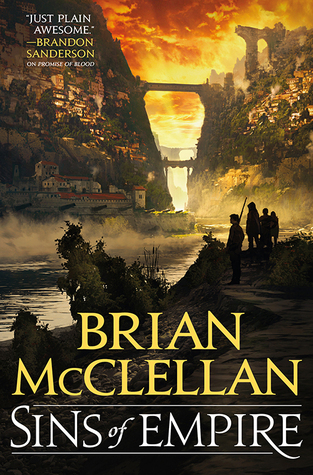 Good for Brian McClellan on writing such a great book. Have you read any of his books? Seriously, they are incredible. Great review, Nicole! I’ve read and loved the first trilogy a year ago. Do you think it’s mandatory for me to reread it before I dive into this one?